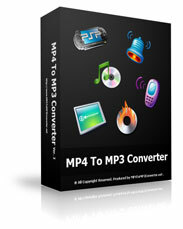 MP4 To MP3 Converter is a windows utility that quickly convert MP4 to MP3 audio format. MP4 To MP3 Converter also supports AVI, MPG, FLV, WMV, MOV and more video formats to MP3, WMA, WAV, OGG, FLAC audio formats conversion. With Cut Feature(in Settings), users can cut audio files to a piece MP3.